Food Adventures of a Comfort Cook: Thatzza Pizza and More! Six years! Thatzza Pizza has been open for six years in Monticello, Utah; where has the time gone? Chatting with Linda Wigginton, owner, operator and head cook, she enthusiastically loves what she does; providing good food to her local and visiting customers. In an area where it’s common for small businesses to come and go, Thatzza Pizza is a cornerstone of the town due to an important reason, listening to the customers. Linda has taken to heart the likes, dislikes, praises and complaints; it’s the only way to know what is the best, how to improve, and, most important, make people happy so they will come back again. Now, and I’ve said this before, being from New York, Brooklyn born and raised, I admit to being a pizza snob. 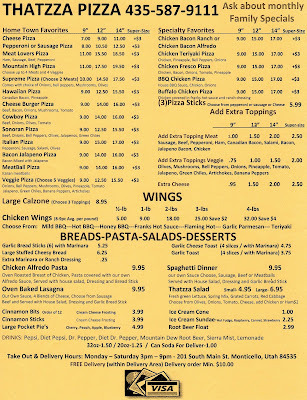 When I first tried the menu items at Thatzza Pizza, I judged by my New York palette and found it seriously lacking. It’s been six years since that first try and here we were, hubby and myself, giving it another go around; so happy we did! By the way, I don’t judge eateries by just the food; atmosphere, attitudes and behavior of the owners and staff make a huge difference as well. 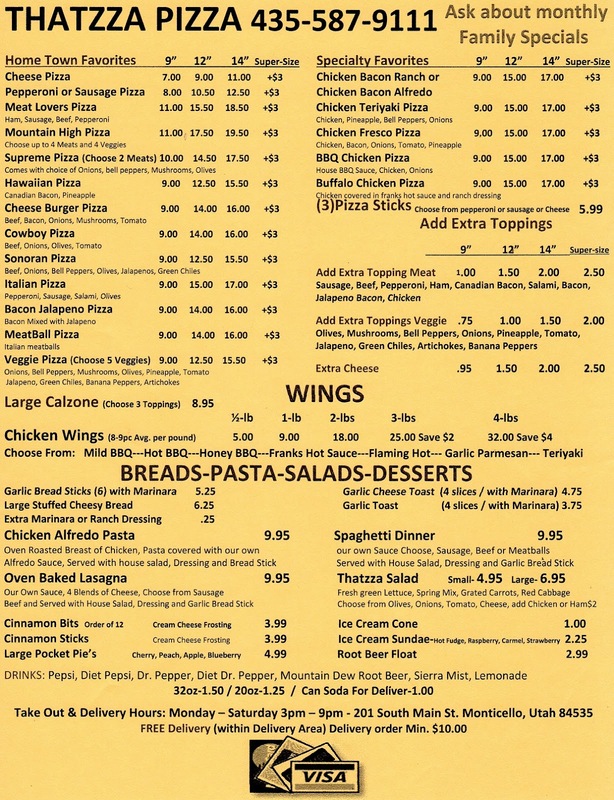 Thatzza Pizza is a small shop, so it’s take out or delivery, but when you enter you are warmly greeted, questions are knowledgeably answered, and you will get exactly what you were craving. The Pizza comes in four sizes, dough is house made and Linda admits she puts a special ingredient into the dough mixture to make it taste extra yummy. I didn’t ask, she didn’t tell and I’m alright with that as the crust was perfectly browned on the bottom and around the edges. The thickness is between thin and pan styles, but inside it’s similar to focaccia bread, light, airy and not doughy. The sauce is also house made, nicely seasoned; toppings are very generous and it just made for a delicious pizza experience. Now when it comes to Chicken Wings, I’m a deep fried fan, but I did give them a try even though they are baked in the oven; Honey BBQ and Garlic Parmesan were our choices. The sauces are not house made, but I recognize the brand Linda uses because I use it myself at home, and it is one of the best on the market. The wings are sold by the pound, so the number you receive may differ as they are a good sized wing. The wings were meaty, sauces infused the meat instead of just sitting on top of the skin; finger licking good! Calzones are a big favorite with hubby and myself, so we had to try out what Thatzza Pizza offered. The same dough is used as for the pizza, but the crust is dusted with grated Parmesan cheese. As a piece of calzone is brought to the mouth, the scent of the cheese invades the nostrils and you know you’re about to enter food heaven. The calzone is stuffed to the brim with ingredients; sauce, melted cheese, delicious meat; as I said, food heaven. Linda had me fooled with the meatballs, I thought they were homemade fresh and I’ve made many a meatball in my lifetime! “No”, she stated, “They are purchased premade.” and I told her she better stick to whatever brand she’s using as they are so close to homemade, I couldn’t tell the difference! Now for some really great news, both the pizza and calzone passed the “cold pizza” test. After sitting overnight in the fridge, the flavors from the house made sauce, cheeses, veggies and meat melded together. No reheating was needed to enjoy a slice, just grab, go and eat! Oh, the wings, those were gone in one sitting, so no leftovers to try out the next day. Folks, if you’re in the mood for some really good food, then I recommend giving Thatzza Pizza a tryout. Hours are Monday thru Saturday, 3pm to 9pm, located on the corner of Main Street and 200 South, just across the street from the post office parking lot. Mangia!